The government has won Commons support for plans to renew the UK's nuclear submarine system, despite a large rebellion by Labour MPs. 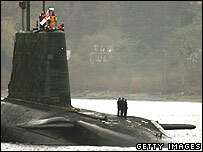 Tony Blair had said it was "essential" the UK began the £20bn plan to renew Trident as soon as possible. After six hours of debate, 409 MPs supported the proposals, and 161 were against - a majority of 248. Earlier 413 MPs had rejected a bid to delay the decision, with 95 Labour rebels among 167 MPs wanting a delay. Rebels included 16 former ministers, including four ex-Cabinet members. On the government's motion to proceed with renewal there were 88 Labour rebels. It was the first time MPs had been given the chance to vote on whether Britain should remain a nuclear power, and the biggest backbench rebellion since the beginning of the Iraq war. The government needed Conservative support to push the measure through. Several hundred demonstrators were gathered outside Parliament, and cheered when they heard the scale of the rebellion. Between £15bn and £20bn would be spent on new submarines to carry the Trident missiles. The fleet would take 17 years to develop and build, and would then last until about 2050. Defence minister Adam Ingram, speaking after the vote, said he had heard some "disgraceful" speeches from Labour rebels, but it had been a "strong and healthy" debate. Conservative defence spokesman Liam Fox said the plan was a "sound, sensible" policy that would ensure the UK would not be subject to "nuclear blackmail" from other states. "It was about us doing what we believed to be the right thing, rather than supporting the government," he said. Liberal Democrat leader Sir Menzies Campbell, who voted for the amendment, said: "The government's got its way, but it's a humiliation for the prime minister that on a policy to which he has attached his own personal reputation he is unable to carry the House of Commons without the votes of the Conservative Party. "It's a bit like the Iraq vote once again." Analysis: Is this the end of the Trident debate? SNP leader Alex Salmond said he believed most Scottish MPs, from all parties, had opposed the plans - and he thought the vote would damage Labour's chances in the forthcoming Scottish elections. He said ministers were "trying to impose on an unwilling country, nuclear weapons of mass destruction for the next 50 years - it's just not on." Speaking during prime minister's questions before the nuclear weapons debate got under way, Mr Blair said: "I think it's right we take the decision now to begin work on replacing the Trident nuclear submarines. "I think that is essential for our security in an uncertain world. See a 360-degree panorama of a Trident submarine control room. "I believe it is important that we recognise that, although it is impossible to predict the future, the one thing... that is certain, is the unpredictability of it." Conservative leader David Cameron agreed, saying: "Replacing Britain's independent nuclear deterrent is clearly in the national interest. The decision needs to be taken now." Some Labour MPs wanted an assurance that Parliament would be able to revisit the Trident issue in the future. Mr Blair said that was always a possibility. Back in December he told Parliament that submarine numbers could be cut from four to three, while the number of nuclear warheads would be cut by 20%. Deputy Commons leader Nigel Griffiths and ministerial aide Jim Devine quit earlier this week over the issue. Stephen Pound - parliamentary private secretary to Labour chairman Hazel Blears - did the same on Wednesday, followed by Chris Ruane, parliamentary private secretary to Mr Hain. Opening the Commons debate, Foreign Secretary Margaret Beckett said large nuclear arsenals still existed around the world and some countries in "unstable" regions were looking to create their own weapons. She said: "There's the potential for a new nuclear threat to emerge or to re-emerge. "Maintaining a nuclear deterrent remains a premium worth paying on an insurance policy for this nation." Are fortnightly bin collections enough? Peter Marshall gains rare access to Trident submarine HMS Vengeance.